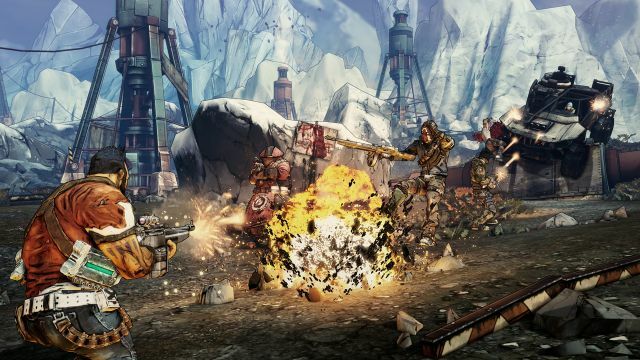 Gearbox Software was showing off Borderlands 2 at PAX Prime this year, showcasing some of the tweaks and changes the game has taken on. The line for the game was definitely one of the longest of the show, with wait times approaching 5 hours. Keep in mind - that's not the wait to PLAY the game - that's to watch a 15 minute developer driven demo in a small theater. People are definitely excited for this one - and so are we. The demo started out in a snowy environment with our new character, the gunserker dwarf, fighting these giant four armed creatures. These creatures moved like huge muscular insects jumping and grabbing vertical surfaces as well as throwing rocks and other objects at you. It was here we first saw some tweaks to the AI in the game, enemies react to where they are being shot, retreat and move to different areas depending on the situation, and definitely seem to react more realistically to your character. Graphically Borderlands 2 definitely looks a bit crisper, the color palette a bit broader, and the animations on characters smoother. An improvement all around I'd say. The biggest change is a completely redesigned interface for managing your character and inventory that got rid of the endless menus in favor of a more focused design. It was here we got a peak at some of the skills for the Gunserker, the one that immediately caught our eye was something called "Sexual Tyrannosaurus." We tried to find out what it did...but we couldn't pry anything out of Gearbox. The comic book style introductions remained for bigger characters as well - the game just oozes style. The demo found it's way to a fortress protecting a dam. The new arch nemesis, Handsome Jack, launched robot enemies from his moon base. You can literally see a huge fortress on the moon where they launched from giving you time to prepare for them to come crashing down. The robots were also fighting the bandit faction on the dam, making it a three way battle. What exactly were you fighting for? The entire battle followed a prison ship that was transporting Roland, one of the characters from the first game. This added an interesting dynamic to the mission as it forced players to keep up and deal with the transport as well as both factions of enemies. Another new thing we saw was that the robots could be rebuilt, so if you took out an arm on a robot a healing bot could come by and rebuild it. Once again...something else to worry about killing. So with all these targets you can see the game is still perfect for co-op and Gearbox is definitely concentrating on making that experience as seamless as possible. They promised to fix the quest mission system so higher and lower level players could both be eligible for the same quests. They enhanced the UI for split-screen play as well and we already knew they added split screen with online. 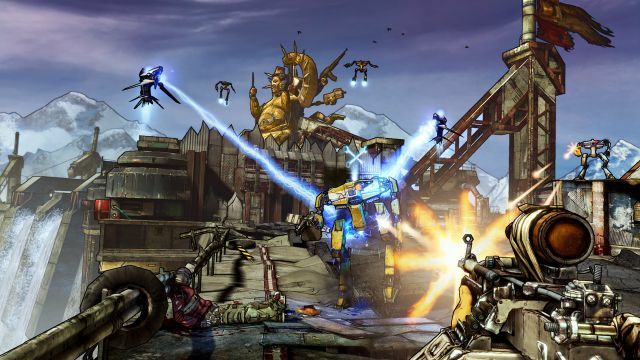 Borderlands 2 is shaping up to be a great sequel to one of the best co-op games of this generation. It really seems like Gearbox is paying attention to the feedback from the community on making a much better game. It's the little things like making sure the PC community has a usable interface and tweaking options, which is something they promised, that lets you know they are definitely reading the forums. It's hard to believe the game is still a year away with the hype train in such full effect.